Enjoy this beautifully crafted home just 10 miles north of Two Harbors. Water and Woods is a vacation rental home located so close to Lake Superior you can hear the waves without even opening the windows. 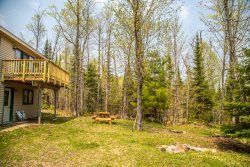 Nestled in the woods with tons of privacy, this 2 bedroom, 2 bathroom home is a beautiful North Shore retreat. Enjoy access to the private ledge rock shoreline that really lets you enjoy the Lake Superior location. This fantastic view will make you feel you never want to leave this beautiful home. You are greeted by floor to ceiling windows and amazing Lake Suprior views from the moment you enter Water and Woods. This extremely unique stone surround fireplace will almost pull your attention away from the incredible views outside the windows. The stone around this fireplace has been pulled from a nearby river and reflects light to make it sparkle. The views just continue as the windows wrap around into the living room area. Water and Woods boasts an open floor plan- great for spending time with family during your North Woods vacation. The living room flows right into the kitchen area. The kitchen is extremely well-equipped with most everything you need to prepare a gourmet meal during your stay. Full size appliances and amazing lake views. What more could you ask for The master bedroom views are absolutely incredible. You are so close to the lake, you can feel the waves crashing against the cliffs below. A comfortable queen size bed and minimal furnishings make this a cozy bedtime retreat. The gorgeous en suite bathroom features a unique clawfoot bath tub. Quaint and cozy with a walk-in shower, as well. The second bedroom is cozy and comfortable and features two twin beds. Plenty of light and a comfy chair to enjoy reading. The guest bathroom is located in the hallway between the living room and bedrooms. The guest bathroom features a walk-in shower. The hallway from the living room leads to the bathroom and bedrooms. The entry way hall as you enter the home and are greeted by those incredible Lake Superior views. Just off the entry way you will find an office space and washer/dryer- perfect for extended stays. It`s time to be creative. Outside, off of the garage, you will find an Art Room. Spend time drawing or painting while you get inspired by the amazing view of Lake Superior. Watch ships pass by during shipping season from the dining room, living room, master bedroom and kitchen. Here you are surrounded by nothing but water and woods. Cute, quaint, and highly unique Water and Woods Cabin near Two Harbors, MN. Gas grill is provided so don`t miss the chance to eat outside and enjoy the nice view and weather. Another grill option for those who prefer charcoal. Look for the sign and you`ll know you`ve arrived at your North Shore home away from home. This place has so much to offer. You will definitely feel like home while you`re on vacation. Enjoy breathtaking 180-degree views from this unique, cozy Lake County cabin. From the moment you walk through the door of Water and Woods, you are greeted by incredible views of Lake Superior from a cabin that simply could not be any closer! You can hear and even feel the waves crashing against the ledge rock shoreline from the comfort of the living room and master bedroom. Named Water and Woods because the cabin is surrounded by Lake Superior and trees for as far as you can see- no visible neighbors provides tons of privacy. The unique craftsmanship from this well maintained wood-framed cabin makes it one-of-a-kind. The home features two bedrooms and two bathrooms on one level (accessed by a wide exterior staircase with a handrail). Light a fire in the wood-burning fireplace surrounded by gorgeous crow creek stone and curl up with a book from a wonderful selection of Northland themed books. With lots of unique decorative touches, including functional wind direction and speed meters inside the home and a wind-up clock, this is a one-of-a-kind home, great for a family getaway year round. During the summer, enjoy several wooded lakefront acres to explore while being a short drive to numerous state park hiking trails. Gooseberry Falls and Split Rock Light House are both just a few miles away. In the winter, gear up and enjoy snowshoeing around the property or cross country skiing one of the local trail systems. Spirit Mountain is only 45 minutes away in Duluth and Lutsen Mountains is an hour and a half if you are looking to take a downhill skiing day trip. The cabin is about 10 minutes from Two Harbors where you will find the Superior Hiking Trail Association Office. Have fun while you enjoy everything that beautiful Lake County has to offer while calling Water and Woods your home away from home. This home is a great retreat for a family wanting to get away for a memorable North Shore vacation! Note: For your security, outdoor fires are not allowed. Art Room for Play and Paint Area, Ski Storage, Waxing Room, Etc.